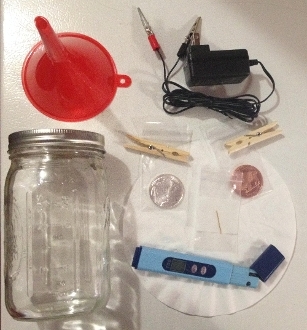 This DIY kit includes everything you need to make your own Colloidal Gold, Colloidal Silver and Colloidal Copper. You just need to add distilled water. Simply take the Silver coin and attach it to the Positive (Red) alligator clip. Then attach the Copper coin to the Negative (black) alligator clip. Next take the clothespins and attach the copper and silver coins so that they are hanging inside the glass jar from the top and about ¼ inch apart from touching each other. Then fill up the water in the jar until the coins are in the water but the alligator clips are not. You don’t want to get the clips in the water else they will pollute the water. You may need to make minor adjustments to get both coins lined up. Once the coins are lined up correctly you can plug in the power adapter. After 15-30 minutes you should see some bubbling going on from both coins which shows that it’s working. Keep this going for 2-3 hours for 5-10ppm. If the water starts to turn a yellowish color, you can stop as larger particles are starting to form. Then let the water settle for 24hrs and filter out the large particles using the funnel and coffee filters. With the PPM Meter you can test the PPM of the water and stop at the desired level. The distilled water should be at 0 when starting and most people prefer the 5-10ppm range. Make sure to clean the coins with a Scub pad and hot water in-between uses. To make Colloidal Copper or Gold simply put the desired element is on the Positive (Red) clip and it doesn’t matter what is on the Negative (black) clip. The mineral that you want to make should always be on the Positive side since DC electricity flows in a direct current one direction from positive to negative. This is why only the positive element is created in the process. When using A/C the current alternates back and forth so both elements must be the same. You can then add other elements as you wish to the positive side to make more minerals. For instance a pure Iridium bullion or a piece of Zinc bullion could be placed on the positive side to make those colloidal minerals as well. It doesn’t matter what is on the Negative side.